Aspiring overseas Filipino workers (OFWs) can find job openings bound for New Zealand in 2018 from accredited landbased manpower agencies with the help of the official website of POEA (www.poea.gov.ph). 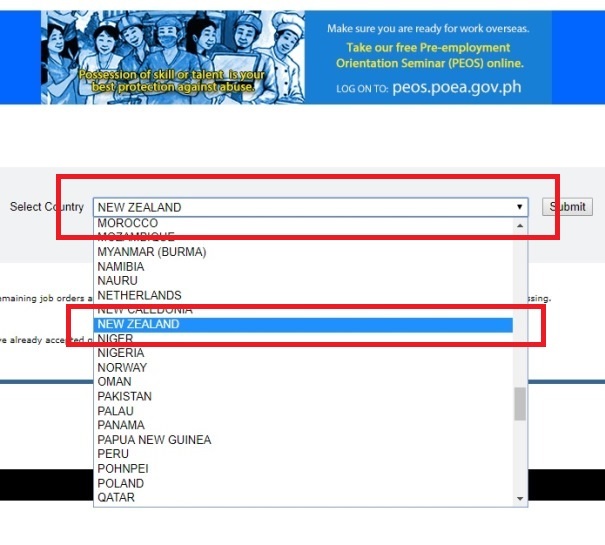 This post will serve as your walk-through, a step-by-step guide so you can browse POEA’s website efficiently and get the details that you need to know which among the thousands of accredited manpower agencies that are currently hiring Filipino skilled workers for their New Zealand based clients. 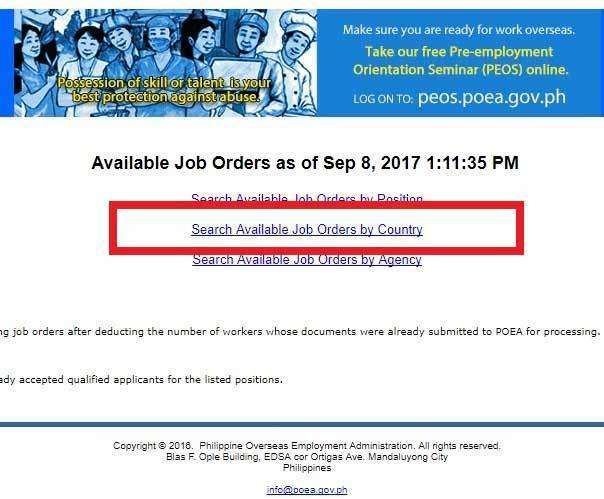 The POEA website will basically show you the country destination of soon-to-be hired skilled workers, job openings (positions available), name of hiring manpower agency, date the job order was approved by POEA, and JO (job order) balance or number of vacancies needed of respective manpower agencies. This post will also provide step-by-step guide on how you can determine the address, contact details, email address, contact person, and license validity duration of specific manpower agency you want to send your job applications. Step 1. Go to www.poea.gov.ph. At the bottom middle of the page you will find the ‘Online Services’. Step 2. Go to the ‘Verification of Agency’s Job Orders’ link. The link will forward you to ‘Available Job Orders as of DATE / Hour’. There are three options / links that you need to choose: Search Available Job Orders by Position; Search Available Job Orders by Country; and Search Available Job Orders by Agency. Step 3. Since you are in search of job openings for New Zealand, you should choose the ‘Search Available Job Orders by Country’. The link will forward you to the page where you need to select the country you want to find job openings. Select New Zealand then click submit. You now know the manpower agencies that have job openings for New Zealand. Choose the agency that is hiring the position similar to your current work experience. Since you already have the name of the hiring manpower agency. The next thing you need to know is their respective office address, contact details, email address, contact person, license status, and license validity duration. 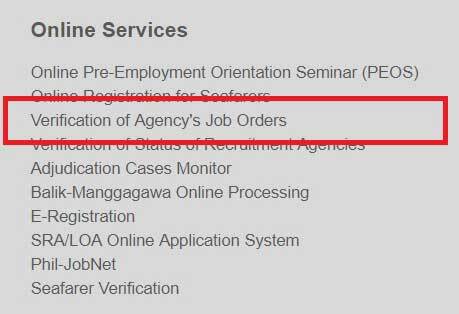 The recruitment agency is said to be legal / accredited by POEA. If it has a ‘Valid License’ status and is operating within its license validity duration. Step 1. 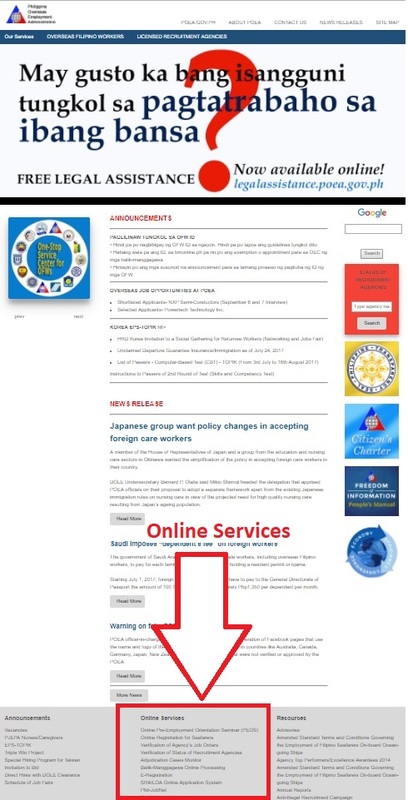 Go to the official website of POEA www.poea.gov.ph. Step 2. At the upper portion of the page you can see red search box with ‘STATUS OF RECRUITMENT AGENCIES title in it. Type the name of the manpower agency which you want to get information about. Then hit ‘search’. Step 3. The new page will show up the details of manpower agency you are looking for. Take note of the details particularly the Status : Valid License and License Validity : 8/2/2010 to 9/25/2026 (example date). Check the details format below based on the official website of POEA. There you go guys, now know how to find job openings bound for New Zealand, the name of the hiring manpower agency, check the latter’s complete details, license status, and validity. Start your job hunting now. 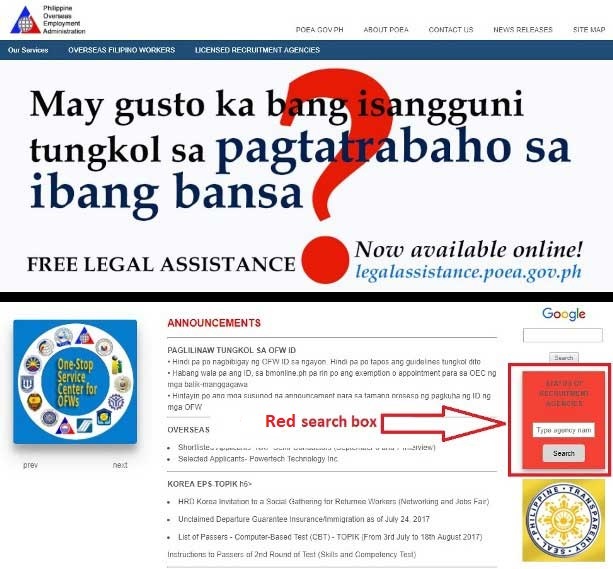 MAG APPLY PO KAYO NG DIREKTA SA MGA NAKALISTANG MANPOWER AGENCY SA POEA WEBSITE. 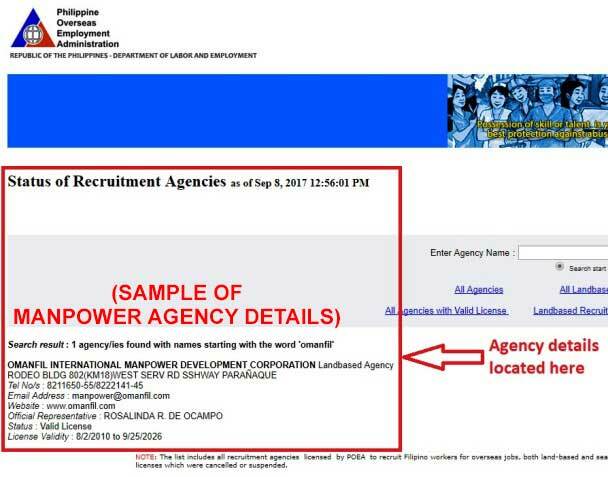 Reminders: ANG BLOG NA MATTSCRADLE.COM AY HINDI MANPOWER AGENCY, HINDI RECRUITMENT AGENCY. PARA PO SA INYONG KALIGTASAN, HUWAG PO NINYO ILAGAY SA COMMENTS SECTION YUNG MGA PERSONAL NINYONG DETALYE. This blog mattscradle.com is NOT A MANPOWER AGENCY, NOT A RECRUITMENT AGENCY. FOR YOUR OWN SAFETY DO NOT PLACE ON THE COMMENTS SECTION YOUR PERSONAL DETAILS.